…or he’s an unholy creature found only in the darkest demon’s nightmares. Yeesh. I vaguely remember seeing the Zoom! box at Blockbuster as a kid and thinking, Nope. Not now, not ever. 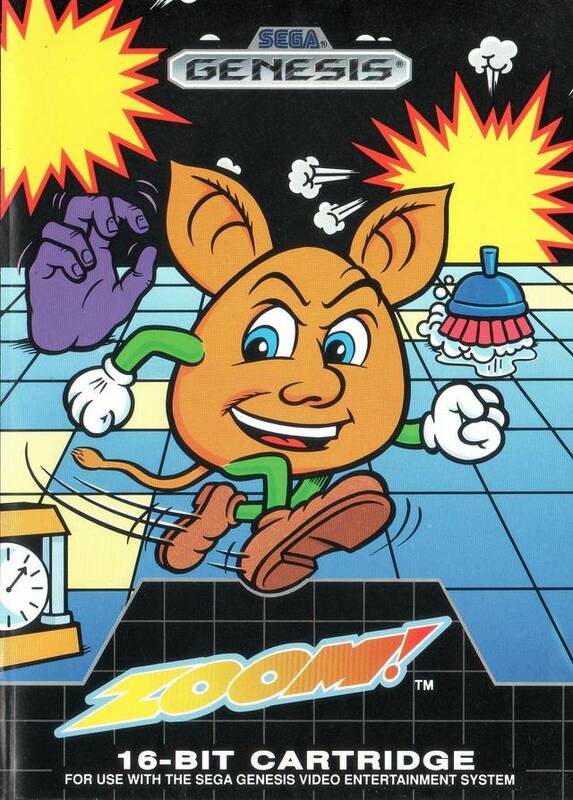 Look at that monstrosity of a mascot: a brown egg with bat ears, Mickey Mouse gloves, prescription shoes, and an evil glint in his eye. Such a creature could never endear himself to children. Thankfully, the protagonist-on-trial – known as Mr. Smart in the instruction manual – resembles more of a squashed Q*bert knockoff in-game. I don’t think I could have played Zoom! with Humpty Dumpty’s pervy free-range cousin. Skating in the crypt for charity! 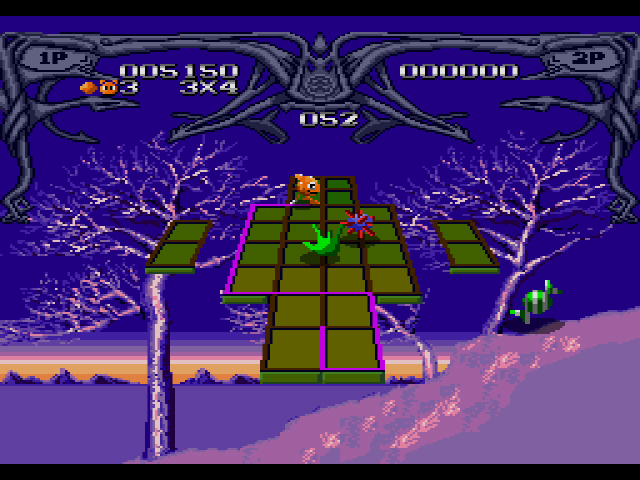 In Zoom!, you control Mr. Smart around 36 pseudo-3D tile boards. 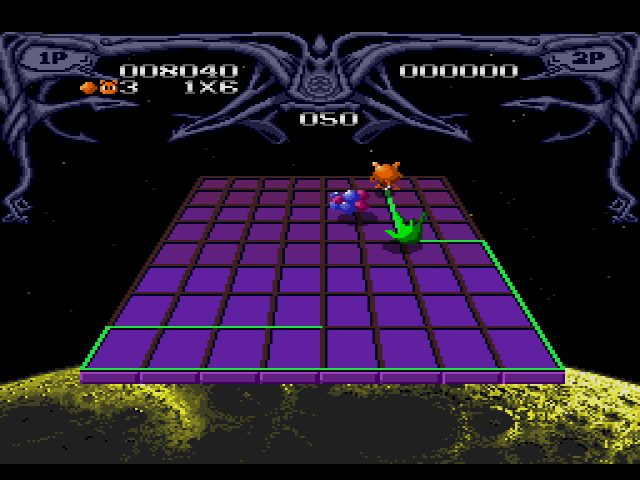 By skating through the gridlines of each tile, you draw colored lines around them. Once a tile is surrounded by colored lines, it blinks and your work with it is done. The goal is to make every tile on the board blink, rack up mad combos by completing several tiles all at once, and move on to the next level. Across each board are creatures called Space Phantoms, and they hinder the promise of a colored tile paradise. The disembodied hand known as Rowdy Fingers chases you ceaselessly around the entire board. The unnerving Spiler erases previously colored lines, while the globular mass known as Cue will run diagonally across one line, back and forth. Spine Spine transports to random tiles around the board, and the jellyfish entity Charm, if touched, slows your movements. One touch by a Phantom other than Charm and you’ll zoom, skip, and possibly be-bop straight into your grave. When you complete a level, the Phantoms explode into gooey caramel clusters. Special items known as Goodies are never in short supply and appear frequently across every level. The two types of Ribbon Candy – while tempting in appearance – are the least important, as they only provide empty points. If you’re fiendin’ for the sweet stuff, why not have a Banana and slow down the Phantoms’ movements in the process? The Hour Glass freezes all Phantoms for a brief period, while the Sun makes you invincible. 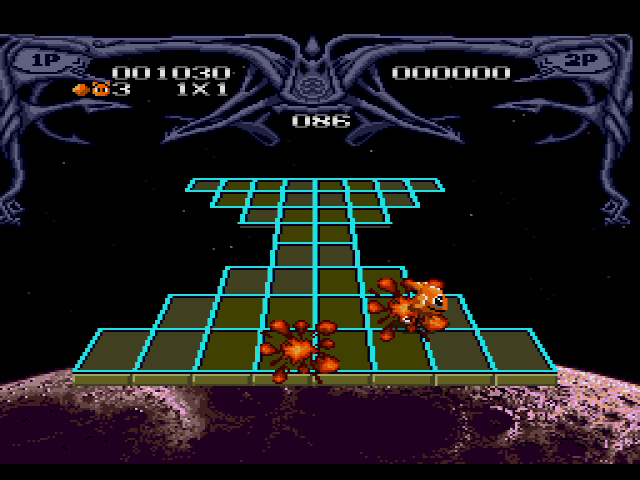 The Mushroom gives you speed, and the Wing kills all the Phantoms on the field, thereby completing the level. Mr. Smart works best near purple snowy vistas. Zoom! is classified as a puzzle game by several outlets, including SegaRetro and GameFAQs, but it reminds me more of a classic arcade title. The emphasis is on points, then stage completion, not the other way around. Mr. Smart has to constantly dart around the stage or he’ll be killed by enemies, just like Pac-Man and Q*bert. And like the aforementioned titles, Zoom!‘s progression is tied into the board/field. In Pac-Man, you eat all the pellets in the maze, then move forward. 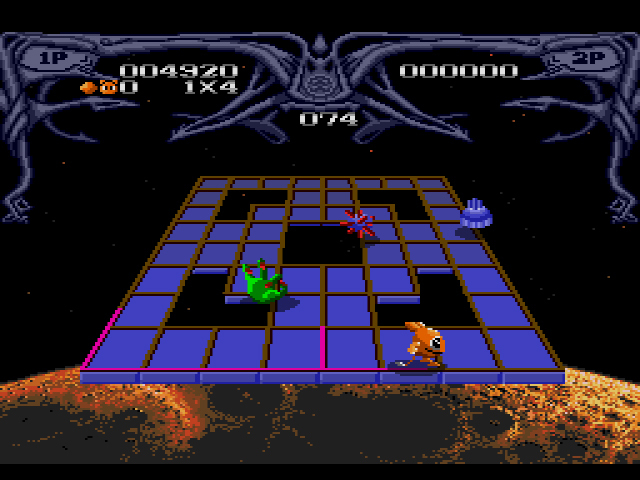 In Q*bert, change the colors of all the squares, move forward. In Zoom!, color in all the lines on the board, move forward. Mr. Smart’s ghost mourns for all the tiles left behind. Zoom! is an odd choice for a Genesis port, particularly at this still-early juncture. Even with the almost-3D layouts, the game doesn’t take advantage of the hardware, and the arcade style hearkened more to gaming’s past than its unknown future. Still, the more lines I colored, the more addicted I became. It’s thrilling to complete the last tile on the board right as you’re about to skate into the cold grasp of Rowdy Fingers. Also, the granulated delivery of Mr. Smart’s catchphrase “Come on, boy!” is hilarity incarnate (which is good since the phrase is repeated every time you get a combo). 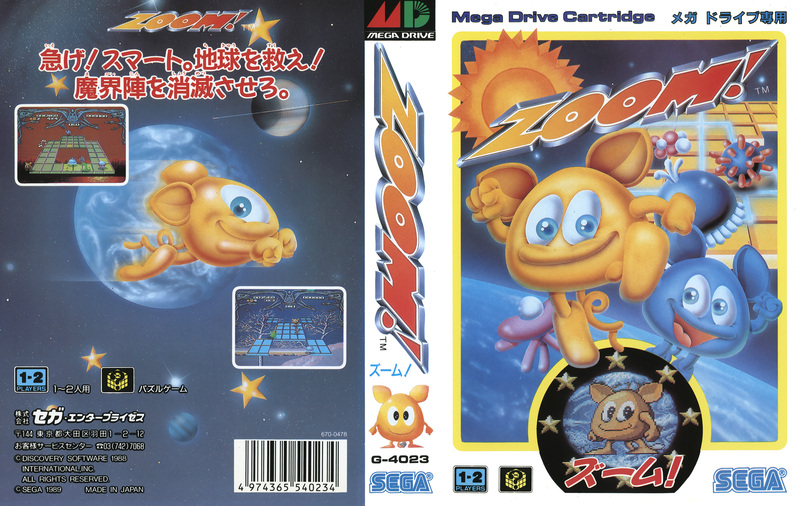 While not a 16-bit showcase by any means, Zoom! produces more joy than its unnerving cover would suggest. That come on boy wore on me VERY quickly. It sounds like something a morning DJ would play over and over again to annoy people. Personally I always had issue with games that weren’t ‘Generation appropriate’ no matter how slick they were. I didn’t want to play Atari style score attack games on my Sega I was looking for new experiences and games that took me on a journey. I wanted fast 16-bit action and games that couldn’t be done on the older systems. I was going to say perhaps I would tolerate this sort of game more now, but I still have the same psychological block today. I’ve always been curious about why Sega decided this game needed a Genesis/Mega Drive port. 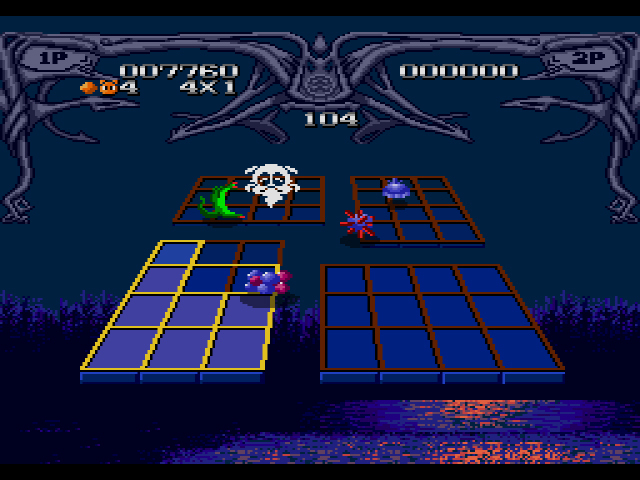 Many of the other ports of non-Sega games that they did, like the Capcom arcade games, made perfect sense, but this was a pretty obscure Amiga game that wasn’t particularly visually impressive even for its time. Agreed 100%. This port doesn’t jive with their Genesis mantra of “Arcade Perfect” whatsoever.